It always amazes me when I discover a new to me author and get enthralled in a story to learn that he or she is so young. There are times I am reading a story and you get the feeling of a very old soul. One who knows, whose lived a dozen lifetimes. One whose been around a while, been writing forever. The ladies on the Well Trained Mind group have been talking up a storm about Sarah Addison Allen's novels so decided I must read one. 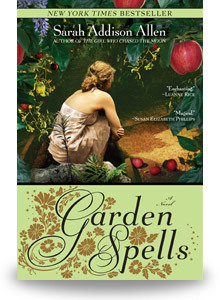 I picked up Garden Spells which I have found to be an incredibly charming story. As it turns out it was her debut novel which was published in 2007. Since then, she's released three other stories which I look forward to reading. Booklist: Take a pinch of marigold to stimulate affection, add a dash of snapdragon to repel evil influences, finish with a generous helping of rose petals to encourage love, then stand back and let nature take its course. It may be the recipe for Claire Waverley's successful catering business, but when it comes to working its magic on her own love life, she seems to be immune to the charms found only in the plants that have always grown behind the Waverley mansion. Like generations of Waverley women before her, Claire has accepted her family's mysterious gifts, while her estranged sister, Sydney, could not run away from them fast enough. Knowing it's just a matter of time before her abusive boyfriend finally kills her, however, Sydney escapes with her young daughter back home to the only place she knows she'll be safe. Barnes and Noble: "Josey Cirrini is sure of three things: winter is her favorite season, she’s a sorry excuse for a Southern belle, and sweets are best eaten in the privacy of her closet. For while Josey has settled into an uneventful life in her mother’s house, her one consolation is the stockpile of sugary treats and paperback romances she escapes to each night…. Until she finds her closet harboring Della Lee Baker, a local waitress who is one part nemesis—and two parts fairy godmother. With Della Lee’s tough love, Josey’s narrow existence quickly expands. She even bonds with Chloe Finley, a young woman who is hounded by books that inexplicably appear when she needs them—and who has a close connection to Josey’s longtime crush. Soon Josey is living in a world where the color red has startling powers, and passion can make eggs fry in their cartons. And that’s just for starters." B&N: "Emily Benedict has come to Mullaby, North Carolina, hoping to solve at least some of the riddles surrounding her mother’s life. But the moment Emily enters the house where her mother grew up and meets the grandfather she never knew, she realizes that mysteries aren’t solved in Mullaby, they’re a way of life: Here are rooms where the wallpaper changes to suit your mood. Unexplained lights skip across the yard at midnight. And a neighbor, Julia Winterson, bakes hope in the form of cakes, not only wishing to satisfy the town’s sweet tooth but also dreaming of rekindling the love she fears might be lost forever. Can a hummingbird cake really bring back a lost love? Is there really a ghost dancing in Emily’s backyard? The answers are never what you expect. But in this town of lovable misfits, the unexpected fits right in"
B&N: "Thirty-year-old Willa Jackson might be returning to her rural North Carolina home to escape her failed marriage, but what awaits her is anything but a smooth, quiet healing period. Instead, Willa tosses herself into a 75-year-old murder mystery and a developing relationship with a local benefactor. 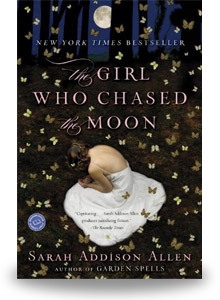 The new novel by Sarah Addison Allen (The Girl Who Chased the Moon; Garden Spells; The Sugar Queen) contains a poignant mix of human drama, sibling feuds, and Southern hospitality." I love novels with strong Southern heroines! I'll be looking for these. I finished book two in week one. I was on a roll. Currently reading books 3-5 as the mood strikes me. It'll be interesting to see which one I finish first. I actually finished FOUR books this week, but I only wrote posts about two of them. I'll list them all at the end of the month so stay tuned. Next up for me, Shakespeare! I'm so glad you are hosting this. Thanks! I finished Jodi Picoult's Sing You Home and today I am starting Bridget Jones Diary! I missed the link for last week so this is my first book! Thanks for the great recommendations. Taking a slight detour from The Fellowship of the Rings to read The Teenage Liberation Handbook: How to quit school and get a real education and life by Grace Llewellyn. Although this author is less conservative than I'd like, the insights about education are fascinating. I love reading books and this challenge will help me keep track of them! Thanks for creating it! 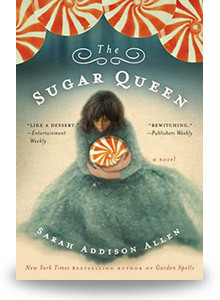 I read Garden Spells and The Sugar Queen a couple of weeks ago. They were like a nice warm blanket! 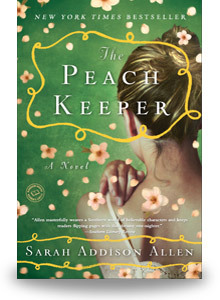 I'm looking forward to The Peach Keeper. Reading Dead as a Doornail by Charlaine Harris. finished The Hawk and His Boy by Christopher Bunn. Good news: loved it. Bad news: it's book one of a trilogy and ends with a huge cliffhanger! Worse news: I joined a tbr challenge and committed to reading no 2012 books until February 1! looks like a fund discovery, thanks for sharing. I finished this book in 4 days. I've finished book 3 and 4. Being sick is putting a damper on my reading. For some reason I can't read much when not feeling well. Just finished Interpreter of maladies for this week. Beautiful book. Mine was beautiful, too -- The Story of Beautiful Girl. I put up a very short post for now, but hope to include more of my thoughts about it later this weekend. "Wigs on the Green" by Nancy Mitford. Second week - Hawkspar by Holly Lisle. I'm not sure which genre to put this in - children-in-danger horror, fantasy adventure, romantic suspense...anyhow, I liked it. Another mystery for me this week, but aren't all stories mysteries? Unless you already know how it's going to end. This one was really about dealing with a Syndrome and I thoroughly enjoyed it. I think another Josephine Tey is on tap for me this week.